Pipelines stand in front of electricity pylons near OAO Gazprom's new Bovanenkovo deposit, a natural gas field near Bovanenkovskoye on the Yamal Peninsula in Russia, Oct. 23, 2012. The last stop on the railway running north from Moscow is Labytnangi, a small town just inside the Arctic Circle. The most reliable way to plow north from there across the great white emptiness is on a Russian-made TM-130 all-terrain vehicle, which drives on tank treads. "Just look around," yelled Vladimir Krivenko, a local railway boss riding shotgun on a recent icy afternoon as he ventured out to inspect work on rail tracks along the frozen tundra. "Riches as far as the eye can see. Oil, gas, minerals. We've got the whole periodic table of elements in this ground." To the untrained eye, the expanse of snow and ice that stretches to the horizon can seem like some prehistoric dreamscape. Its only inhabitants are nomadic deer herders, who still worship pagan gods, and whose flocks are terrorized by a species of giant weasel called a wolverine. But under the permafrost, this frozen tundra remains Russia's land of milk and honey, the source of much of its enormous wealth. The natural gas reserves in Russia's Arctic region, at the current levels of price and consumption, would generate enough fuel to feed Europe for around 75 years, with a total value of almost $17 trillion. More immediately, it will be tapped to foot the bill of campaign promises from the recent presidential race. In the months before his reelection on March 4, President-elect Vladimir Putin made campaign promises worth more than $170 billion in social spending, according to Russia's biggest state-run lender, Sberbank. He promised to double the wages of doctors, policeman and college professors, triple stipends for many students, and boost the program of "maternal capital" that pays mothers to have more children. (This last provision was to help solve Russia's demographic crisis, which has seen the population drop by 5 million people since the fall of the Soviet Union.) Putin also promised to "completely re-arm" the military at a projected cost of $777 billion over the next decade and to build new housing for veterans. Those promises may have helped shoe-horn Putin back into the Kremlin, but such payouts  some of which began early this year, when Putin was still Prime Minister  have pushed the federal budget into its first deficit in a decade. On Thursday, March 22, Putin convened a meeting of his government to figure out how Moscow will pay for all this. "We have to ask ourselves on whose dime will we reach these goals, and where will we get these financial resources, which are far from small?" he urged. None of his ministers had a very good answer, and Putin made the vague suggestion that cash could be raised by "increasing the efficiency" of government spending. But it's hard to come up with $170 billion through nips and tucks in the federal budget, so the real answer to Putin's question seemed to come the following day, March 23, when he called a meeting of Russia's oil and gas industrialists. "Today the proven gas reserves in Russia are the biggest in the world," he reminded them. "Nobody has more than Russia." More than a quarter of Europe's gas comes from Russian fields, and after last year's nuclear disaster in Fukushima, Russia's biggest energy clients, particularly Germany, are shifting away from atomic power to natural gas. That means demand will likely stay high. So, Putin's orders to his energy men: Step up your drilling, particularly in regions like the Yamal Peninsula, the great energy frontier of Russia's frozen north. 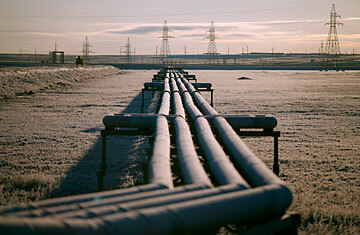 "In essence," Putin said, "we will turn Yamal into the new oil and gas province of Russia." Thus Krivenko's rail work inspection near the base of the Yamal Peninsula, whose name in the language of the local Nenets tribes means "the end of the earth." His team was equipped with two huge pots of salted fish, about ten bottles of vodka to help keep warm, and a few mp3 players filled with shanson, Russian rock's equivalent of gangster rap. On the train platform at the end of the line, the idle wagons were loaded with pipeline parts for Gazprom, the natural gas monopoly that serves as the government's cash cow. Tax payments from this one company account for a quarter of the federal budget. Out in the tundra, Krivenko met up with the crew of workers who make sure that equipment reaches its destination. Using an old locomotive whose face has the blades of a giant meat grinder, they clear the tracks of snowdrifts that would otherwise render the line impassable. "Things have been busy up here," says one of the engineers, Sergei Buslovsky, 31, lighting a cigarette. "We are busy mining so that Moscow can spend." The remark had a tone of bitterness common in the north. Resource-rich regions like Yamal are not given much say in Russia's centralized economy, and nearly all the earnings from their oil and gas fields are channeled back to Moscow.